← Article18: Here are some tips for selecting a “Great Interior Designer” for your project. Some of you might ask what is CEDIA Expo? One response might be with a chuckle, it is the love child of an Interior Designer and a Technology Guru. This event host thousands of technology products for residential to commercial building applications. This is where you find “smart homes” that through a mobile device you can control the temperature of a building and turn on and off lights miles away or even automatically dims when the sun is able to provide enough lighting into that space. It is a place of magic in a child’s eye that might whisper “here be dragons”. For those of you that missed the CEDIA Expo in Indianapolis this year, don’t stress, I have the scoop for you. Here are my favorite picks as an Interior Designer for this show, they are not in any particular order. -Enjoy! Trufig is designed to assist in maintaining a consistent and non-intrusive appearance when added into the interiors. The design can blend easily because it is flush mounted and therefore does not create shadows and protrusions, along with having the versatility to mimic almost any material by being incorporated into its design. When this product is applied it appears seamless into the design verses the traditional product the subtracts from it that many interior designers struggle with. Here is another product, Invisible Sound by Sonance, that is seamless in the design of speaker systems. This product can be completely hidden by applying many different types of finishes on top of it. Some examples shown at the show are drywall, wall paper, wood veneer, and fabric. This is a great alternative to the traditional speaker boxes that can be eyesores and even the round flat speakers that can still make ceilings and walls look like Swiss cheese. Trak-kit is a great solution for multiple locations and even a hidden alternative for televisions. The system allows users to place their televisions in multiple locations in a room, which allows more versatility in design. One issue many interior designers come across in designing for seating areas is the focal point of the room. 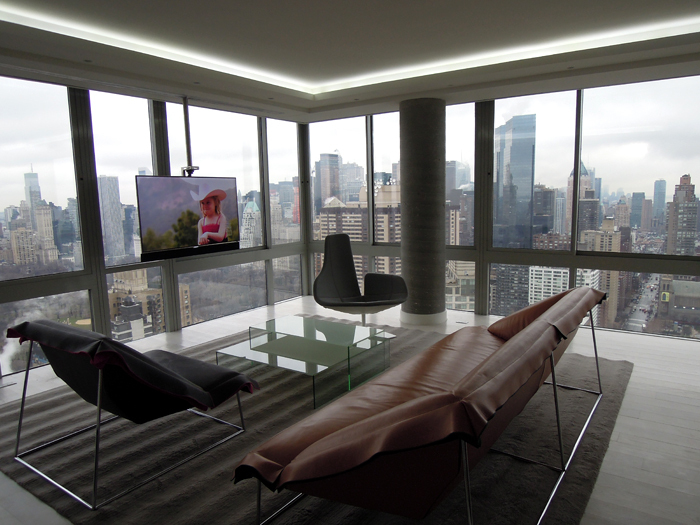 When the room has a spectacular view of a lake, woods, cityscape the seating is designed to take advantage, however when the users plan to incorporate a television this can have challenges and deter from the view. This option allows for the television to be relocated on even hidden when not in use, and only placed in optimal location when in use. Seura is a great choice for innovative “inside the box” thinking. The quality of the image and the amount of options a designer can choose from demonstrate that this is a system is truly designer friendly and can conform with an interior designer’s imagination. This system is also a great alternative for an area where you might not want a television taking the focus which allows when the television is off the mirror to blend into the background perfectly. Last but not least, is a product that is not only aesthetically pleasing but highly functionally in design. MechoShade by MechoSystems offers many options for window treatments. Three important items, I would like to point out are versatility, ease of maintenance, and sustainability. They offer products that allow a client with tight budgets to upgrade in the future to the more expensive mechanical system seamlessly without needing to throw away the entire system. This system also offers ease of cleaning and renovation, as the panels can easily be “snapped off and back on” and the material be changed out easily. Many of the shade cloth options are non-pvc and have Greenguard and cradle to cradle certifications.